A one-stop shop for analogue beats, the Schlagzwerg's CV sequencer is the cherry on the cake. Deep bass from a tiny box. The CV sequencer adds life to beats. It's like a little science lab to work with. In true MFB tradition, this combination drum machine/step sequencer is compact, cute and very analogue inside. It sits comfortably on the desktop and the interface is a tweaker's paradise of knobs, buttons and sockets ready for patch cables. At the heart of the Schlagzwerg are five separate old school analogue drum modules - kick, snare, toms, hi-hat and cymbal. These all have a selection of sound shaping parameters for sonic variation, plus the ability to modulate them through a bunch of CV inputs. Driving the rhythm forward is the built in 6-track step sequencer - one for each voice plus a spare. Each pattern is 16 steps with two variations named A and B and 16 pattern memories in total. Thanks to the handy cycling mode, A and B can be combined into a longer 32-step sequence at the flick of a switch. To make things more interesting, there are six additional CV outputs, which can be programmed along with the pattern to transmit 16 discrete values per sequence. For those looking to groove it up a bit, there are seven degrees of shuffle along with regular 16th note lock down. "At the heart of the Schlagzwerg are five separate old school analogue drum modules - kick, snare, toms, hi-hat and cymbal." The Schlagzwerg is equally at home receiving MIDI through the port at the rear. This can be used to sync the sequencer to a MIDI clock, or to trigger the individual drums through note-on messages. There are four programming modes to work in; choose between the internal sequencer or MIDI as the brain, and sending the data to the pre-wired drum modules or to the external Gate/CV outputs. Each MIDI channel can be used for one trigger and CV pair, and the keyboard is split into four zones. This makes it possible to send triggers and CV separately or together, depending on your needs. In mode one trigger and CV are sent between C1 and B2, C3 triggers the single drum sound, while CV only is sent between C#3 and B4. The final zone places the triggers for all the drums next to each other from C5 upwards. 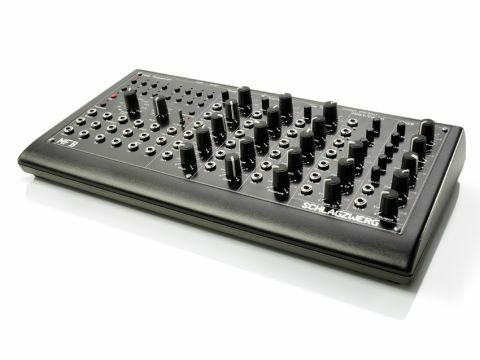 This arrangement conveniently allows the unit to be used as a basic six-channel MIDI-to-CV converter. Bear in mind that since the key span is only two octaves, this will provide some limitation when using CV as a source for pitch, but might be fine for modulation sources. The compactness of the interface means that the controls are rather simple to learn. On the other hand, it's not always obvious (from reading the online manual) what direction the dial needs turning, or how long to press a button before a function is completed. The 16-step buttons are very small but firm and have a corresponding red LED to confirm the trigger. The button LEDs also double up as status indicators for displaying the programming mode, pattern selection, programming mode, shuffle strength etc. The status mode is engaged by pressing the Rec and Sequence buttons on the far left. The two dials are used, among other things, to select which drum or CV track to program, and set the CV value. Beside this is a three-position mini-switch to change between the pattern variations A and B or cycle between them. Above that is the start/ stop button for manual use - and there's no lag in the response. Below this is a row of 2.5mm mini jack slots for synchronising the sequencer section to an analogue system, while the final two rows house the six CV and six Gate outputs. The sequencer can only be programmed when it is running, which in turn, would suggest that it is rock solid when switching between patterns and variations on the fly. This is certainly true; an interesting point not mentioned in the manual is that it waits till patterns are completed before switching to the next, but switching between the A/B variations is instantaneous. It can store the patterns in its onboard memory, but this is limited to the one bank of 16. "The raw drum sounds are easy to shape and the range of controls keep them sounding authentically retro." The raw drum sounds are easy to shape and the range of controls keep them sounding authentically retro, with a range that can be warm, fuzzy, soft or crisp. The Schlagzwerg stays faithfully within the realms of vintage analogue drums and has a very different character when compared to an 808 or 909. The kick can dive deeper than the 20Hz theoretical limit of the modern day digital studio, but the shape of the envelope pitch drop is fixed so there's not so much variation in that area. It can get nice and clicky by increasing the attack, and by combining the drive stage with the mixer level, it's possible to dial in a range of saturation. The Schlagzwerg's old school approach to programming with the added bonus of patch cables is all good fun in use and can definitely result in different and creative sounds that you might not come up with a mouse. It was a wise move to include the six CV outputs, as these really bring the sounds to life and having to adjust all the settings by ear makes a refreshing change to VST automation.